Shopping for Girl Scouts Roleplay? The Girl Scouts Cookie Oven allows aspiring bakers experience the hands-on fun of making their own Girl Scout Cookies. The Girl Scouts Cookie Oven is a real working oven, and comes complete with tools and mixes that allow girls to make cookies that look and taste just like the real thing. There's also a viewing window that lets bakers see the treats they're making and a warming station to heat and melt delicious cookie coatings and frostings. Oven measures approximately 17-inches x 10-inches. 120V oven. Ages 8 and up. 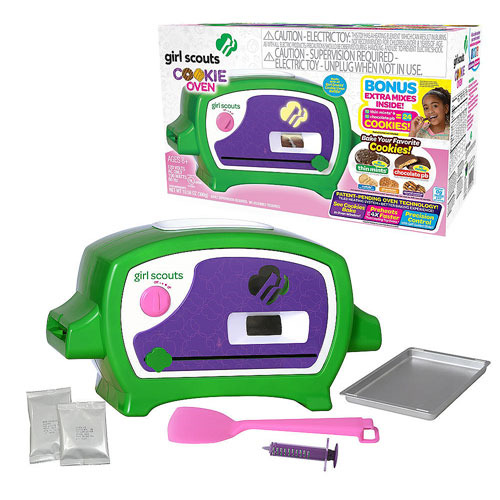 The Girl Scouts Cookie Oven contents include (subject to change):Girl Scouts Cookie Oven, Chocolate flavored cookie mix and mint chocolate flavored coating to make 6 thin mints, baking pan, double-sided spatula, "The Perfect Cookie" ml measure tool.